Viral hemorrhagic fevers (VHFs) are a group of illnesses caused by four families of viruses. These include the Ebola and Marburg, Lassafever, and yellow fever viruses. VHFs have common features: they affect many organs, they damage the blood vessels, and they affect the body's ability to regulate itself. Emmett was a son of Judge John T. and Lucretia Graham. Though young Mr. Graham was unmarried, he had numerous friends. And he was respected enough at his place of business, that "the store was promptly closed on the announcement of his death." The life of this sterling young man passed out last Thursday afternoon at 2 o'clock. He was ill only 89 hours with that dread disease, hemorrhagic fever, superinduced with chill and fever. Emmett Graham was born and raised in the community of Unadilla and in his life the young men of his day may be encouraged to greater efforts for in his achievements his life shows what a poor farmer boy may accomplish ever under adverse circumstances. He was head clerk and purchasing agent for the large mercantile establishment of Barfield, Wilson & Co., and enjoyed the confidence and esteem, not only of his employers, but of the entire community in which he lived. His popularity was attested, not only by the great concourse that followed his remains to Harmony cemetery, but by the universal regret and encominus [sic] of praise expressed by all at his untimely death. "He will be missed," but the memory of his manly bearing, his unblemished character and his thoughtfulness of friends will be cherished and kept green in the hearts of his legion of friends who saw in him all the attributes of a noble young manhood. On the flip side of the once elaborate tombstone pictured at the top of this article, is an inscription dedicated to Johnie T. Graham, Jr. This brother of Emmett's was born 27 August 1877, and died 24 October 1898. Another of the Graham sons gone at such a young age. What a nasty way to go. Poor, dear fellow. interesting post. 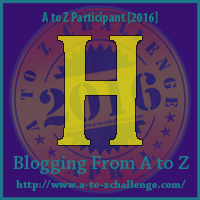 I doubt I ever would have found your blog without the AtoZ challenge. It surprised me to see he died from hemorrhagic fever so long ago. For some reason, I thought that was something more recent. An unpleasant end for Emmett. Really enjoyed your post - I've always found graveyards interesting and hearing the stories behind the names is wonderful. Thank you ladies for stopping by. I'm real excited to be participating in the challenge, and meeting more fellow bloggers.